What do you need to create a product? First, an idea of how it will look in the end. Then follows a long process of product creation that takes a lot of time, effort, a team of professionals, and a team leader. To transform any idea into a profitable product, a company has to go through several stages to set a vision, define a strategy, develop a product, and sell it to the right people. 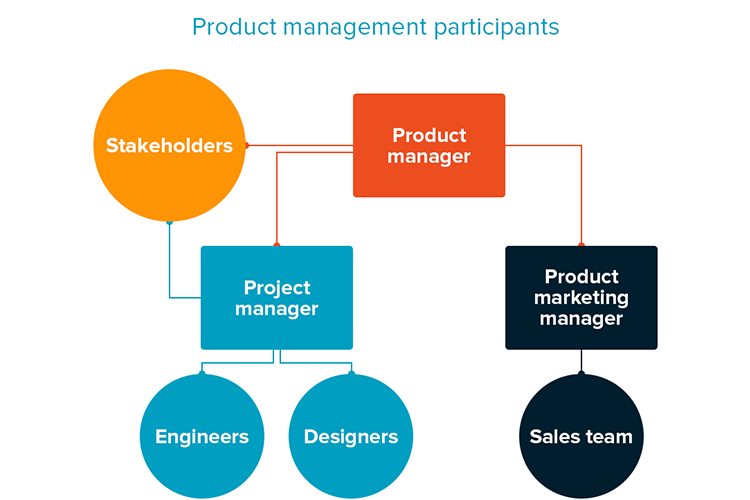 This article examines the details of product management, describing its main stages, and a product manager’s responsibilities in this process. Product management is a process that focuses on bringing a new product to market or developing an existing one. It starts with an idea of a product that a customer will interact with and ends with the evaluation of the product’s success. Product management unites business, product development, marketing, and sales. 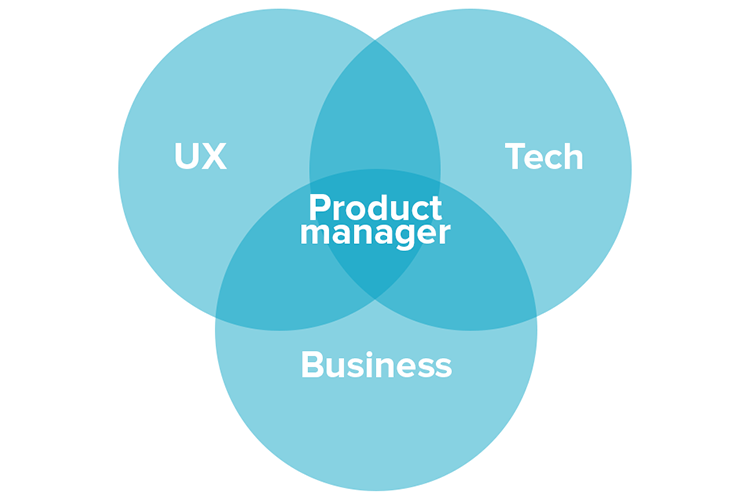 Product management is led by a… product manager. Don’t confuse the role with a project manager. A project manager is responsible for a single part of a product lifecycle – product development, while a product manager’s responsibility is to lead a product from the germ of an idea to launch, focusing on features, business value, and the customer. Read our full comparison of product managers vs project managers in the dedicated article. Every product team consists of several players, including those at the management level. Usually, there are three: a product manager, a project manager, and a product marketing manager. Each manager has one’s own responsibilities, limited to his or her sphere of concern. The product manager’s role is much wider and includes activities on every level. Let’s define the responsibilities of the first two to understand a product manager’s role better. Project manager. This person coordinates the internal process of product development making sure that the project follows a timeline and fits a budget. The project manager tracks progress and coordinates all internal resources and members of the team (engineers and designers) to deliver the product on time. Stakeholders. These are the people who have an interest in the final product, can influence the process of product management and development, and are involved in decision-making. In product management, stakeholders can be clients, investors, even users of a product, or all of them combined. Shared responsibilities with Project manager: develop project documentation, communicate with stakeholders and clients, report the stages of the work to the clients and/or stakeholders. Shared responsibilities with Product marketing manager: pricing, customer feedback collection through interviews, surveys, focus groups; market research, development of sales tools, analysis of sales data. Marty Cagan, the author of Inspired: How to Create Products Customers Love defines the goal of a product manager the following way: “to discover a product that is valuable, usable and feasible.” So, a product manager has to be knowledgeable in three main spheres: business, technologies, and user experience. The first thing that a product manager does is see the opportunity to develop a new successful product or improve an existing one, adding necessary features to it. The product manager must be aware of current trends to make the right decisions when a company decides how to build or improve the product. A product manager has to make sure that all members of a team work harmoniously to achieve the main goal. This person is also responsible for the outcome of a product launch. While there’s no single set of KPIs and responsibilities for a product manager, they usually include monetization, user engagement, and the level of user satisfaction. The KPIs may vary depending on the company and industry. Some product managers focus mainly on development, writing specifications, and supervising development progression, while others display more focus on marketing and sales by developing a marketing plan and training a sales team. While at first it seems like a product manager performs administrative tasks rather than making something, that is not true. They are constantly working on the improvement of the existing product, analyzing data, doing market research, and observing current trends of the industry. Eventually, a product manager has to make the final decision on what the end-product should be like and the strategy of its development and launch. Each of the stages may include inbound and outbound activities. A product manager doesn’t perform all activities but supervises their implementation. Product vision is a significant part of product management. If we were to compare product management to a road, the vision is both a road sign and a destination: Vision defines the final product and shows the direction towards achieving it. It’s not a strategy of product development yet, but this is where the strategy development starts with idea management when a team discusses a new product. The vision can be articulated during a brainstorm or may be based on a backlog of ideas. 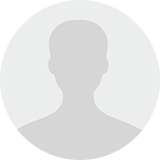 What is the user persona (personas) for the product? Which problems will the product solve? How can we measure the success of the product? Geoffrey Moore in his book Crossing the Chasm suggests using the following template for the product vision definition. Once you have the vision, it must be translated into a specific strategy. While a vision defines the goals for a product, strategy describes a way to achieve them and sets main milestones. This must be a clear and realistic plan for the team that works on a product. An effective product strategy defines the main features of a product, users and their needs, and key performance indicators (KPIs) that the product must meet. Strategy development starts with market research. Market research is a process of information collection and analysis of the market and its present or potential customers. It comprises the study of potential customers’ spending habits and their attitude toward products of a similar kind. 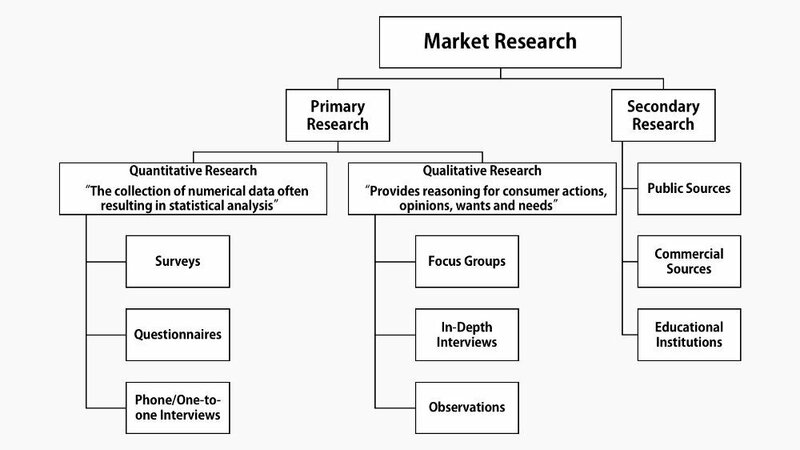 Market research is made by a company (primary research) or taken from an external source (secondary research). Secondary research involves already produced data that can be found in statistical databases, journals, online sources, etc. Primary research is adapted to a company’s needs and can be either qualitative or quantitative. Qualitative research focuses on defining problems and relevant issues. This incorporates personal interviews, group surveys, and focus groups. Quantitative market research is based on data collection and statistical analysis. It allows a product manager to reach a larger audience and gather general information, while qualitative research provides insight into a problem, identifying wants and needs, as well as possible pitfalls. Market research is important for new product development, both at the stage of execution and the stage of marketing and sales. By using it, a company can understand what customers want and develop a strategy that will allow for making a successful product. 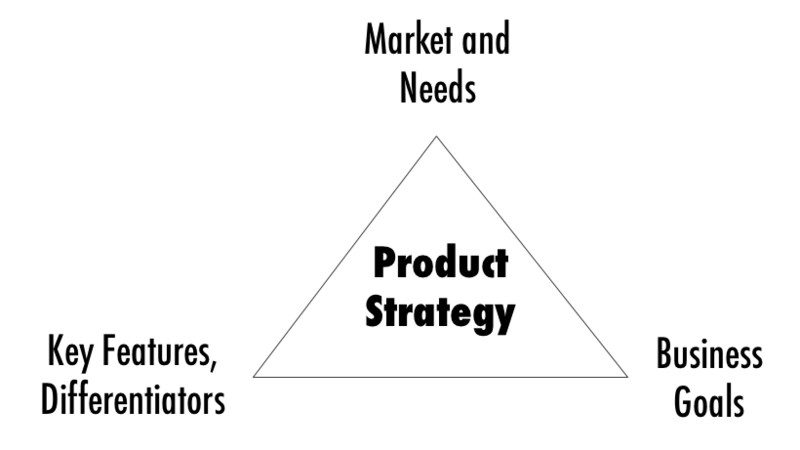 Product strategy is typically documented in a written roadmap form that would allow a team to control the work at all stages. A roadmap is a tool that provides a framework for a team with a timeline and specific actions, illustrates the vision, goals, and the current state of product development. Read our dedicated article, if you want to learn more about strategic roadmaps, their types, and how to build one. A good roadmap is clear and serves as a visual guideline for all members of the team. Regardless of the specific roadmap structure, it must depict the current state of things and the next steps. There are different roadmap templates and their formats depend on the number of products (a single or multiple product roadmap) and aspects of product development (goal- or feature-oriented). However, any roadmap must group the items by the sequence of their implementation. Roadmaps can also be internal or external. Internal roadmap. An internal roadmap is used on a company level. It shows the vision, short- and long-term goals, as well as connected processes. Teams that work at different stages of product development can track the timeline and stay aware of the upcoming actions. A product manager and a CEO use an internal roadmap to control the progress. External roadmap. An external product roadmap is usually less complicated and is created for stake- or shareholders, potential and existing customers, investors, etc. Prioritization is an important responsibility of the product manager at the stage of roadmap preparation. The objectives, aims, and activities must range from the most to the least important. When the strategy is ready, the product manager has to communicate it to the product team and the stakeholders. A product manager has to be focused on customers and stakeholders at the same time. And though a customer always must be a product manager’s priority, maintaining efficient working relationships with stakeholders is also important. Stakeholders have a large influence on product development, being able to cut the budget, or change the timeline. They can suggest implementing product features they find necessary and important, but which are completely useless to users. The product manager’s task is to communicate strategy to stakeholders to ensure common understanding of the vision. During the execution stage, a product team starts to work on the product itself. They build a new product or add new features to an existing one. Main phases of this stage are product development, internal and external testing, and the application of feedback results. All along the execution stage, a product manager controls the implementation of the roadmap and participates in accompanying activities. Product development. Product development starts with defining technical specifications, making first prototypes, and a mockup design. While these activities are normally covered by the UX team, a product manager can be involved in writing technical specifications. The product manager’s main goal is to identify what the users want and communicate this information to the development team and project manager. For this purpose, he or she conducts focus-groups and personal interviews with potential customers. Results of these activities allow a product manager to prioritize the necessary and unnecessary features. He/she writes product related documents, for example, a Product Requirement Document (PRD) and Functional Specifications Document (FSD). Learn more about software documentation practices in our dedicated article. External testing. One of the core responsibilities of a product manager is to define the minimum viable product (MVP) and make sure it serves its purpose. When the MVP is released, a product manager sets up a feedback collection mechanism, gathers the feedback, and alters product requirements based on user input. A/B testing is one of the most common evaluation techniques. The main idea behind the practice is to choose the product features that are more useful to the customers or enable higher customer engagement. A product manager defines testing scenarios in cooperation with a UX specialist, tracks results, and communicates the changes to the project manager. To conduct successful tests, a product manager sometimes develops a relationship with potential customers making sure that they will be honest about the usability of a product. While testing, the specialist analyzes the user reaction and, once the hypothesis is tested, the customers’ feedback. When the results are ready, a product manager has to convey them to a project manager, so that the developers can prepare the software for launch or introduce changes to the existing product. Once the product is completed, it’s time for it to enter the market. At this stage, marketing and launch plans have to be finalized, and the sales teams trained to start distribution. Through the whole process, the product manager delivers an operating plan, which aims to track the growth of a product in the market: the revenue, ROI, key customers. In larger businesses these activities are usually distributed among executives from the product, sales, and marketing teams. After the product launch, the manager monitors its progression and reiterates the same steps across its lifecycle. The product manager also analyzes data to understand the success of a product. The number of products sold, customer feedback – all these are analyzed and communicated to the product marketing manager to improve sales and marketing strategy. According to statistics, each year over 30,000 new products are launched and 85 percent of them fail. While there are many different reasons for this, one of the most significant is that too many products are not thoroughly prepared for the market. Neglecting one aspect of product development and focusing excessively on the other usually leads to financial losses. With proper product management, it’s possible to evade such consequences and increase chances of the product succeeding in the market.